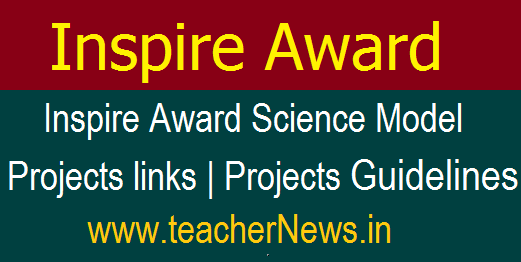 Inspire Award Science Model Projects links | Projects Guidelines : AP / TS Inspire Award Science 2018 Projects and Guidelines / Instructions for preparing Project Report Book and Sub title of Project Report Inspire Project Videos. Instructions for preparing Project Report Book download here. 'Make in India' through skill development besides many other plans of action. Indian Science Fairs Useful Web Links for different Science Categories Useful Web Links/ Useful Web Links for Science Fairs. Indian Science Fairs Useful Web Links for different Science Categories this links need to build 'Make in India as Digital India. India has made exceptional advances in various branches of science and has imprinted its niche as a forthcoming science hub in general with special presence in the fields of space research, traditional and alternative medicines, computer science and basic sciences. The fruits of scientific advances need to be equally valued by each and every citizen. It is crucial that science touches, influences and ushers in a positive change among scores of individuals who were denied the comforts of scientific advancements due to multitude of reasons. We are privileged today that the current leadership in the country has been trying to accelerate development with inclusion and equality with action plans for employment generation strategies, quality health education, good governance, farmer centric issues, connectivity through Digital India and allied sectors, Swachha Bharat and Ganga rejuvenation, energy conservation, 'Make in India' through skill development besides many other plans of action. The theme of 105th Indian Science Congress, Reaching the unreached through Science and Technology’ shall deliberate upon the value of taking science to each and every citizen of India. How to Submit School Children Online nominations to DST at INSPIRE Award Scheme Website, Submit nominations of eligible children to DST at INSPIRE Award Scheme Website, Register-School-E-Management-Inspire-Award-Scheme-Website-inspireawards-dst.gov.in: First go the website by entering the url address http://www.inspireawards-dst.gov.in/. Indian Science Fairs Useful Web Links for different Science Categories, Inspire Award Science Model Projects links | Projects Guidelines Download.